"I arrive here, and the first day I say, 'Let's go look at the product lineup.' And they lay it out, and I said, 'Where's the Taurus?' They said, 'Well, we killed it.' I said, 'What do you mean, you killed it?' 'Well, we made a couple that looked like a football. They didn't sell very well, so we stopped it.' 'You stopped the Taurus?' I said. 'How many billions of dollars does it cost to build brand loyalty around a name?' 'Well, we thought it was so damaged that we named it the Five Hundred.' I said, 'Well, you've got until tomorrow to find a vehicle to put the Taurus name on because that's why I'm here. Then you have two years to make the coolest vehicle that you can possibly make.'?" The 2010 Taurus is arriving on the market this spring, and while it is not as startling as the original 1986 Taurus, it is still pretty cool." 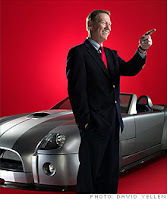 Photo of Alan Mulally courtesy of Fortune magazine. While I am sure the Ford dealer in town appreciates your generous remarks, I think it is important to remember that there are car dearers in town other than Ford that contribute to the welfare of Kern County, not to mention support our local newspaper. Agree. One of the things our local dealerships have in common is that they are all locally owned and all do their part to be involved in the community in a big way. Three-Way Chevrolet and Motor City are big time community sponsors as are the others. Our community needs these guys and I am unabashedly pulling for 'em all. I have focused on Ford because of its somewhat unique position of staying out of the fed bailout program and its new leadership.